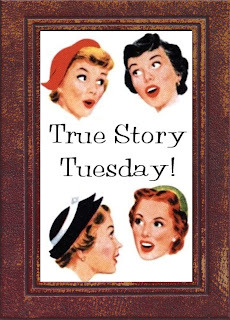 Hey y’all, it’s True Story Tuesday time! A chance to share something outrageous, amazing, hilarious, miraculous and (mostly) true that happened to you! Just grab the code under the button in the right sidebar and add your link – we’ll be glad you did! This one is from just prior to Itty Bit’s arrival. The current residence was just not going to work for adding a baby to the mix. A beautiful view of the lake, a quiet lot, and the size was right. Unfortunately, the lovely wooden stairs were the clincher in why we needed to find another place. My 7-month pregnant belly had slipped down those steps three times already. And I didn’t even want to think of the panic of chasing a crawling kid around those things. So off we went with our realtor friend, looking at homes with property – just in case we got a chance to get a horse again. Ain’t she cute? She was the perfect size for me and look how adorable she was with the dog! And here I am – clueless that I was 4 weeks pregnant! I cannot believe I ever got that close to the horse that turned into a psychotic freakoid and became dangerous (once the drugs wore off, you lying horse traders). Ahem… back to the story. So I was heartbroken having to give up the horse and hoping for a place with fields for a less dangerous horse. We found a place for sale not far from Mr. Daddy’s parents. It was an old farmhouse with a giant barn and shop. I really thought it would be a good fit for us. We walked up to the porch and greeted the people that were drinking and playing cards. They seemed surprised to see us, though the realtor had called ahead. Then we walked in and the place was a mess, stuff strewn everywhere. More people were inside and excused themselves - taking their beers out to the porch. We picked our way through the mounds of clothes in the living room, to the kitchen with piles of dishes and food. I was trying to picture the place all cleaned up and painted… it was a challenge. We walked through an open mudroom (and MUD room would have been appropriate), to see tiny bedroom in the back. There was some dude lying on the bed in there with more piles of stuff stacked around him. He looked like he was sleeping so we quietly backed out. Our realtor was trying to make the best of it – staying professional and talking about what could be done with the place. The door next to the bedroom had to be the bathroom – there was no place else. So she swung open the door and kept talking. I think she finally saw our wide eyes - and just then, she turned around to realize that she’d been standing there describing the bathroom, with the door wide open, while a man was obviously doing.his.business on the toilet. He was completely silent – as were we – and our realtor turned a brilliant shade of red and started stammering. She backed out of the bathroom as quickly as she could, pulling the door closed behind her. The entire house-hunting party stood there holding our breath – knowing that we desperately needed to be somewhere where we laugh uncontrollably. Oy… we saw so much more than we wanted to! What about you? Ever been the victim or inadvertent cause of an embarrassing moment? Do share! Add the link to your post below and we’ll be by to give some comment love! Lordy, I would have died! Wanna take bets that the house is still on the market? LOL What were those people thinking? Have they not watched the home and garden channel? You gotta make it look like a resort and then MAYBE you can sell it! Oh My GOSH...I would have died standing there...what a sight, and smell!!! When our house was on the market it was my fear that a realtor would want to show it as it's worst...but nothing as worse as that!!! WoW!!! Omg! What that house actually on the market or did y'all want into another one by mistake?? I don't think I would have made it out of the house before laughing hysterically (and giving those homeowners a piece of my mind!) So, I'm guessing that's not the one you purchased either! Oh, and I want to hear the psychotic horse story sometime...sounds freaky! We went to see a house like that one time. It wasn't quite that bad, but the back end was falling off of it and it looked like it had been pieced together. It was seriously odd and I can't believe a realtor even walked us through it! Oh lordy! I would have turned 5 shades of red, too! Wow, they obviously REALLY wanted to sell that house. I wonder if they were the renters? They probably didn't want the house to be sold, so they didn't try too hard to keep it tidy for the realtor. I didn't get a TST written up for today. Too much going on this past weekend and week. Hubby is home sick with a sick kid and our friends are laying down some floors. Busy, busy! The funniest things happen to you. Oh my gosh. This is a great story!!! First let me say that I laughed when I saw the dog on the horse. How cute....but the laughter continued as I read about the man "doing his business"....what a funny yet horror story for the real estate woman! I spent this whole post waiting for you to say at the end that the realtor had taken you to the wrong house! Instead, I ended up thinking it was a good thing you left before the police raid--were those guys smoking any funny smelling stuff?? Cuz that would have to happen for a guy to sit silently on the pot while an agent described his surroundings, right? I can't stop laughing! I can't stop snorting. That is hilarious. How did you not just bust out laughing while standing there. That poor Relator. LOL that is soooooo funny! I would have been sprinting to the car! OK, I wrote my comment and then went back and read the other comments. Turns out I'm on the same wavelength as Pam D. here. oh my word!! you seriously have the craziest stories! I think I would have just died!! That poor guy on the toilet! OMGsoh!!! That is hilarious!! I seriously do not know how you guys end up in these situations!! 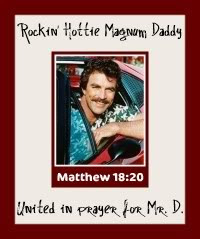 Too funny about it still being on the market LOL!! I've never walked in on someone ... but I've been walked in on. So embarrassing! That horse had a crazy look in its eye! Thankfully you weren't killed by it or die laughing at the house viewing debacle. That is just amazing! I just got around to reading all the link-ups. You had a theme going this week and never even knew it! Bodily functions galore all around! I'm sorry I missed TST. I have been SWAMPED!